Gastown, originally known as “Gassy's Town”, was established the year Canada became a nation and eventually grew into one of Canada’s largest cities. 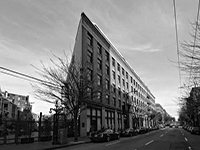 Gastown, while not a separate area as far as Real Estate/MLS boundaries are concerned, now exists as a distinctive and historical area nestled in the bustling center of downtown Vancouver. Gastown is a refreshing mix of both new and old, with residential real estate and commercial real estate which features condos and lofts in buildings that maintain their original historical exteriors but offer modern fully converted urban interiors. Various shops keep the streets buzzing during the day, while a host of Vancouver’s most popular restaurants and nightspots keep the area lively well into the night. As Gastown remains one of Vancouver’s most up & coming areas, it is undergoing steady real estate redevelopment. More and more Vancouver residents are finding a permanent home in Gastown...just like the old days. 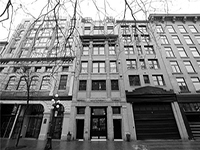 Gastown is within walking distance of most downtown hotels, shops and attractions. Transportation is also readily available, with access to mass transit merely blocks away and the old CPR Station on Cordova Street. In addition to being a major tourist attraction, Gastown is home to many local businesses in the fields of entertainment, media, architecture and consulting that serve not only the local market but also the world. Consult Amalia Liapis, your Gastown real estate professional, for more information. 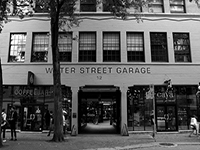 The Garage is an excellent example of Gastown heritage conversions and was built by the Salient Group in 2009. Many of these modern loft homes feature a/c, exposed brick, polished concrete flooring, power blinds, open integrated kitchens with Meile appliances, overheight ceilings, raised living rooms and more! Building is located in the heart of Gastown, around an intimate commercial courtyard that includes a teahouse, local designers and more. Exterior of the building dates back to 1889. As with a lot of homes in Gastown, much of the parking is leased. The historic Van Horne is a collection of wildly varied single and split level condos, lofts and live/work spaces. 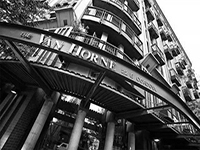 Built in 1997 (heritage conversion) the Van Horne is one of the best values in Gastown and trends towards a lively and youthful community. Many of the homes here have been extensively reno'd (and often without permits) and many of the smaller studios do not come with parking. The Koret Lofts, designed by Alda Pereira, are a collection of modern New York styled lofts and is located, primarily, at 55 East Cordova St. Like many Gastown lofts and live/work spaces, homes here can be quite varied -- but most feature dramatic overheight ceilings, exposed beams & piping, polished concrete flooring, reclaimed brick walls, open bright layouts and more! Close to everything in Gastown, Koret Lofts are always worth seeing for anyone interested in Gastown. 27 Alexander Street is actually a unique combination of two separate Gastown heritage conversions - The Alexis & Alexander. Both buildings share the same address, lobby, common hallways and parking entrance...but are in fact two different stratas (LMS1862 & LMS2650). Condos & Lofts here usually feature open layouts, exposed brick/piping, overheight ceilings, sleek design, high quality finishings, fireplaces, patios and views. 27 Alexander is a very unique building in one of the best areas of Gastown! • Gastown's infamous Steam Clock is an attraction for both tourists and locals alike. Every quarter hour and on the hour, the clock whistles and blows steam for a brief moment. Situated on the busy Water Street, the Steam Clock is nestled between an abundance of unique restaurants, chic cafes and unique shops. Take a stroll down the cobblestone walkways and take in the beauty of the historic yet modern buildings on each side of the street. • Gastown has a plethora of restaurants that are worth checking out. Here's a few of our favourites: Chill Winston, The Flying Pig, Water Street Cafe, Jules, Tuc Craft Kitchen, Nuba and much more! • If the nightlife scene is for you, there are many options for bars, clubs and pubs. From sit-down pubs like Portside to Irish bars like the Blarney Stone and the Irish Heather to dance clubs like MIA to live music venues like Guilt and Co.
• Every year, the Gastown Grand Prix is something to look forward to. For one day, the charming cobblestone streets of Gastown are transformed into one of the fastest, best-loved and most challenging cycling race courses in North America. This event is free for spectators and is guaranteed to be a fun afternoon/evening out. There are three races during the course of the night which include Youth Race. Pro Womens and Pro Mens. This event is sure to draw a large crowd with thousands of people scattered along the race course. • The streets are shut down for an annual music festival ringing throughout the Gastown area. Make Music Vancouver transforms Gastown into an outdoor music party and is a free live music celebration with hundreds of artists participating and draws a large crowd to this amazing spectacle.